The photography of Molly Matalon brings life to the mundane. Molly Matalon is from Florida, and so am I. Molly lives in New York, and I do too. As far as I know, the similarities stop there because Molly is an very talented photographer, and I can barely use the flash on my iPhone. But Molly's artwork makes me miss home and my mom, and what can be better than that? I don't know how she does it, but somehow Molly transforms everyday objects into something more (would it be cheesy to say beautiful?). When I think of Molly's work, her photo of the lone palm tree in some gravel pops into my head. Although the plant appears fragile in its depressing environment, its isolation accentuates its simplicity, and that somehow makes it pleasing. Molly's portraits of her mother range from casual to posed, but they each seem extremely personal and loving. It is interesting that Molly's photos of plants and people evoke a similar reaction in me, because plants lack an emotive face, while people, obviously, do not. Domesticated houseplants and mothers often appear as innocent, attractive, and defenseless, which makes them appear sympathetic. However, Molly controls the perception of both her mother and nature from behind her lens, and gives them a sense of power through her focus. I spoke to Molly about Florida, the thoughts behind her photography, and her mom, and it was an absolute dream. THE LE SIGH: Hi Molly! Introduce yourself! Where are you from, where are you now? 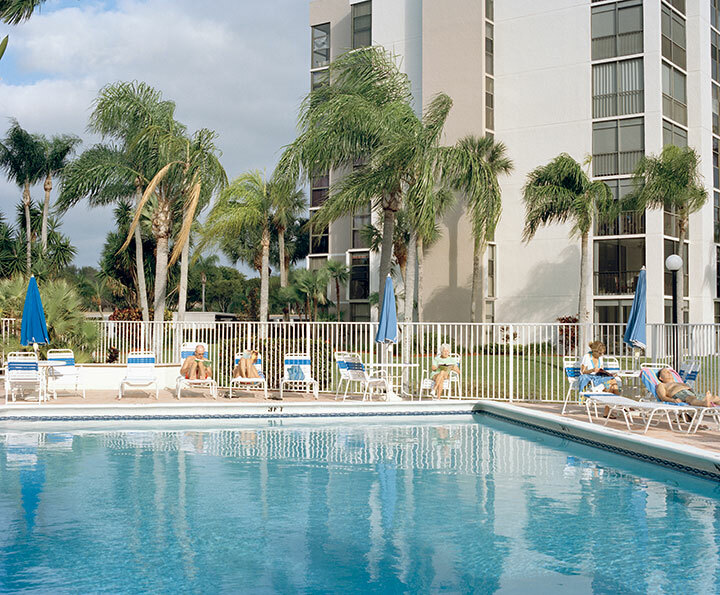 Molly Matalon: My name is Molly (duh), I'm from Boca Raton in the depths of sunny south Florida and now I am just going into my senior year at the School of Visual Arts to get a BFA in photography and I live in Bushwick in Brooklyn. TLS: How did you become interested in photography? MM: I'm trying to think of an answer to this that will not make me sound like a total weenie. I just always liked to take pictures so I kept doing that until it came to a point like most people who are into photography like I am where it's the only thing you care about. TLS: How did growing up in an area without a large visual art scene affect you as an artist? MM: I'm from Boca Raton/Delray Beach/West Palm so it's super faux in terms of plastic surgery, oversized homes in over the top kind of gated communities and there is no real landscape, the closest thing to it is like...the beach (which is still artificially kept perfect) and the bits of grass next to sidewalks. I think this has a lot to do with how I have grown into a visual artist. I think growing up in a place with little to no culture let alone a visual art scene at all has helped me to be really specific about the kind of art that I like. I spent a lot of time looking at photography on the internet and I spent a lot of time with Diane Arbus books. TLS: What artists inspire you? MM: Alec Soth, Jenny Holzer, Taryn Simon, Stephen Shore, Laurel Nakadate, Doug Dubois, John Baldessari, Larry Sultan, Rineke Dijkstra, Ken Price, Diane Arbus. I could really go on forever. TLS: What are you listening to right now? MM: Right now I am listening to Rick Ross. I love Rick Ross. TLS: The photos of your mother range from vulnerable to formal. Does your relationship to your mother change when you are behind a camera? MM: I believe that some of the portraits of my mom double up on both formal and vulnerable. Some of the more "formal" portraits of her are quite revealing of different aspects of her whether it be her attention to detail when putting on her "face" or her innocence and sensitivity to the world. When I am behind the camera, our relationship works for the better, there is often little to no talking. Sometimes I will give her a bit of direction but mostly she does her thing for the camera, and I think that bit of calmness that comes from making pictures of her benefits our relationship. She is loud and outgoing, always owning a situation. By making these pictures of her it has given me a purpose to engage more with her and it has helped us become really good friends. I mean, when I am not making of pictures of her we still are friends, but before I really began this journey our relationship was on the rocks. TLS: What is the difference between taking portraits and less formal photos of your family? MM: The less formal portraits of my family give the people in my family a chance to be more of "themselves". I always consider the kind of camera I'm using when making pictures, the less formal ones are made with a point and shoot camera and it's completely non-threatening and I feel that the people in my family are having more fun and it's not a chore for me to have them sit down for me and make a formal portrait. I think the formal aspects of my portraits are more pictures of me and them at the same time, if that makes sense. TLS: Your work includes object arrangements. How do you pick which objects work together? what types of objects attract you? MM: In the past year, I've become really into making still life's and having them live within my bodies of work. Sometimes I dig through old boxes of stuff in my parents' houses and find old photos and things that talk to me about parts of my life. Things that are kind of goofy. In this still life I made that's on a yellow backdrop, it has a fake plastic lawn flamingo, palm tree shaped pens, and a bottle of this stuff called Florida Water that is supposed to be a fragrance. To me, these things have to do with the tackiness of south Florida, but also talks about real/fake, toys, possessions, decorative aspects all relating to a specific part of south Florida that I'm from. I also really like shells, I need to start making pictures of things that are not shells, haha. I love fake fruit, and anything that is really poorly made and kind of dumb. I live near like...400 dollar stores so I frequent them looking for stuff. TLS: What other subjects do you see yourself documenting as you grow older? MM: As I grow older I don't know...my professors in school always ask me when I foresee my projects being finished so I can move on. I think that's the hardest thing, I always feel like I can make a better picture and I just haven't done it yet. But I would like to photograph soccer mom "culture" a lot. Check out more of Molly's photography on her website.